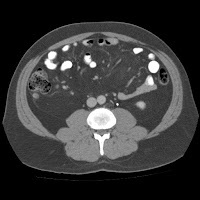 I always look at my own CT scans on rule-out appendecitis cases. (We surgeons arrogantly fancy ourselves as board certifiable in radiology, didn't you realize?) When I see a scan like the one above, i know the case is going to be a bear. Probably 90% of my lap appies take 10-25 minutes. What you see above is a classic retrocecal appendix. You can tell by how high it is (tip extending toward liver rather than down toward pelvis) and by its location directly behind the cecum (hence retrocecal!). Plus the patient was a rather large, bulky dude. So you know you're going to have to roll up your sleeves and go to work. 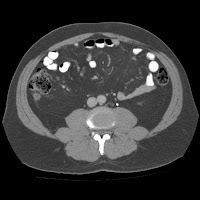 You find you often have to mobilize much of the entire ascending colon just to see the damn thing and then you have to dig it out of indurated, inflamed retroperitoneal fat. I actually had to place an extra port to finish the case. Took me an hour. Still better than an open procedure, IMO. An extra port isn't all that bad. Doing him open would have been a real bear. At least I never have long enough fingers to reach all the way up there! Another article was just published (Laparoscopic versus open appendectomy in men: a prospective randomized trial. Surg Endosc 2010 Jun 15), essentially trying to "prove" that lap appy is of no benefit.